The first two areas deal with preparation. An exhibitor will not be successful against even minimal competition without doing lots and lots of homework. When I was a junior beef exhibitor, I quickly learned that I would much rather face an EXCELLENT calf that has average grooming and training than an AVERAGE calf that has excellent grooming and training. The good part about this is that with dedication to proper feeding, grooming, and training, any exhibitor can be very successful with their show cow. 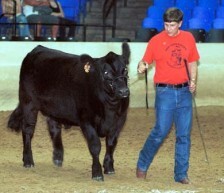 First, a show calf must be properly groomed to accentuate it strengths. Conversely, proper grooming must also account for a calf’s weaknesses. The beginning task here is to help the calf grow lots and lots of hair. Next, the exhibitor should trim and fit the calf to cover it’s weaknesses. For example, properly grown, trimmed and fitted hair can give your calf the appearance that it’s hindquarters are four or more inches thicker than they really are. Training the hair requires hundreds of hours of washing, blowing, and brushing. My ag teacher used to say, “Wear out a rice root brush,” regarding working the hair at home. Next, training the calf to “set up” is important. Setting up is the exhibitor having the calf stand so as to emphasize it’s strengths and cover it’s weaknesses. There are two basic ways of doing this, the side profile where the calf is viewed from the side with one of the rear feet set forward of the other, and, rear view where the feet are usually placed squarely under the four corners of the calf. The set of the distance of the feet apart is determined by the strength of the animal’s back – shorter for sway back, longer for a roached or bowed upward back. The way to train a calf is to do your homework. Lead it 10 feet, stop and set it up as desired. You must do this hundreds of times to begin to train the calf. Placement of the animals in the ring is important. You should keep at least one body length between your calf and the next whether you are lined up head to tail or side by side.